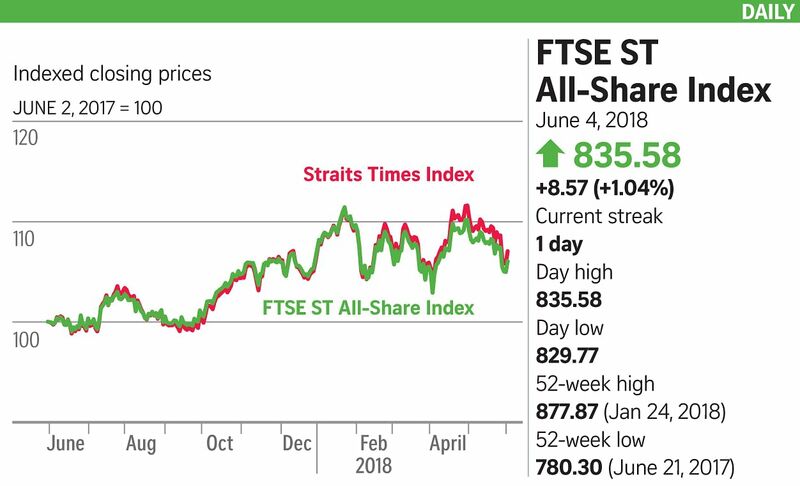 Recovering lost ground from last week, the Straits Times Index (STI) yesterday rose 39.97 points, or 1.17 per cent, to finish at 3,467.48. The increase was the largest since April 19. Some 1.4 billion shares worth $900.8 million were traded, with gainers outpacing losers 240 to 179. The three local banks each registered an increase of close to 2 per cent, on market expectations that the United States Federal Reserve will raise rates by 25 basis points to 2 per cent this month. Analysts expect three rate hikes this year on the back of the latest euro zone uncertainty, trade war concerns and the fact that the Fed is becoming increasingly tolerant of an inflation overshoot. On the local bourse, shares of Creative Technology surged 67 cents, or 11.2 per cent, to $6.66. This followed news of the digital entertainment product company's showcasing of its new game-changing Super X-Fi technology to live-streaming broadcasters and influencers in Taiwan at Computex 2018, ahead of the hardware launch in the third quarter. Market watchers also attributed the price surge to the company's triumph over Huawei International last week following a long-drawn legal tussle. The win accompanies fresh legal damages of $2.3 million that Creative expects to book as income for this quarter, on top of the roughly $36 million that Huawei had been ordered last year to pay Creative and its subsidiary QMax Communications. Delong Holdings also rose significantly, after steel firm Evraz Group announced on Friday that it was disposing of its approximately 15 per cent stake in the steel producer to Best Decade Holdings for US$91.7 million (S$122.6 million), or about $7.42 per share, a huge premium over the counter's trading price. Delong finished $1.09 higher at $5.50. City Developments rose 11 cents to $11.36 after a Bloomberg Intelligence report said the property developer has become a "weighty rival" in Singapore's increasingly competitive land market, as local and foreign developers bid up prices in a push to capitalise on the city's residential housing recovery. Its growing land bank should allow it to boost home sales at the risk of achieving lower margins, the report added. Amid a flight to safety, with the US 10-year Treasury yield trend ranging between 2.7 and 2.95 per cent in the short term, DBS Group Research believes that this should lend some support to yield stocks.